There are many types of bows available, and if you are thinking of getting one you should know the differences between them. The recurve and compound bows are the two most popular, but they are not similar. By understanding both, you can make an informed decision. A comparison of recurve vs. compound bows can highlight the benefits of both. The recurve bow and the compound bow are the two most popular options in modern archery. Both have their pros and cons, and the details of each bow should be considered if you are deciding between the two. 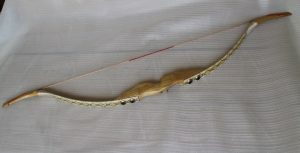 The recurve has a deep-rooted history in world culture, including Native American history and the world Olympic games. The compound bow, on the other hand, is a very recent invention that utilizes the physics behind pulleys and modern design. The first recorded appearance of the recurve bow was around the third century in ancient China.5 Before the recurve, bows were only straight-limbed, with both ends curving toward the archer. The limbs of the recurve face away from the archer, which adds energy to the shot. When recurve bows were first introduced around the third century, there was confusion because the design despite the problems when this bow was introduced, the recurve bow has become the most popular option in the world. 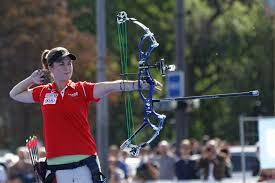 The Olympics, as well as many major archery tournaments, will only allow recurve bows. Since the recurve bow is lightweight and fast to shoot, it is a good option for hunters. Waiting for long periods of time in uncomfortable hunting positions requires a light, simple bow. A large, complicated bow will not only be tiring, but it will most likely make more noise. All other traditional bows have a history that extends thousands of years, but the compound bow was invented in the 1960s. It is clear at the first glance that this bow is entirely modern. Holless Wilbur Allen manipulated a traditional recurve design, and with modern engineering techniques, the compound bow became the world’s latest bow and arrow. The compound bow is created with an emphasis on physics and engineering. By placing pulleys on the restructured ends of the bow, more tension and energy is preserved in the shot. The pulleys also created the “let-off” effect, which would be the compound bow’s greatest feature. The compound bow’s most popular feature is the “let-off” effect. The let-off effect revolutionized how a bow can be drawn back by the archer. A traditional bow would get tenser as the bow was pulled back, and the archer would feel more and more strain. This led to fatigue and lowered accuracy. With the inclusion of pulleys, this problem was solved. When an archer pulls back, the pulleys activate and the tension actually goes away once the bow is pulled to a certain point. With minimal tension, archers can pull back as far as they want without overwhelming tension getting in the way. Since the recurve bow has a more accurate shot but it is cumbersome, it is a great choice for competitive archers. In competitions, the additional weight of the bow is not a major problem like it is when hunting. The “let-off” effect is very valuable for shooting the arrow a farther distance without adding any tension to the bow. With a recurve bow, the farther you pull back the string the stronger the tension, and high tension makes it harder to control the bow. Instead, an archer can pull back the string and have just as much control as a close shot. The compound bow may look intimidating and confusing with all of its pulleys, viewfinders and web-like design, but it actually makes shooting the bow easier. Since it’s creation, it has become a popular bow for serious archers. The recurve bow may seem overly simple, but it is designed purposefully for ease of use. It is a beginners bow because it is lightweight and does not require extra tools. The compound bow, on the other hand, does not seem simple at all. There are many pulleys and scopes that are not exactly intuitive. Once you start using it, though, the technique starts to become second nature. By looking at a recurve bow vs compound bow comparison, it is clear that both have their own pros and cons. Choosing between the two depends more on what your specific needs are as an archer. If you are a beginner or want to take your bow on long hunting trips, you should start with a recurve bow. If you’ve been shooting for a while and want to increase your strength and accuracy for competitions, then a compound bow is best for you. By understanding the differences between the bows, and what your specific needs calls for, you can make the most informed decision.